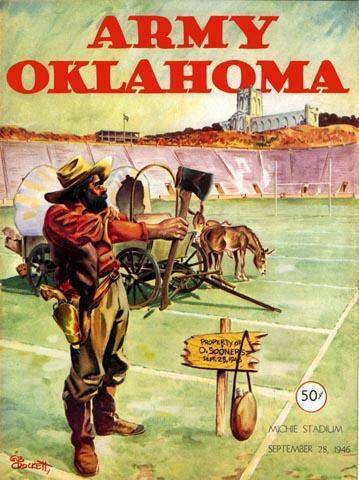 Although the Sooners lost their first game of the season to an Army team which had been unbeaten since 1943, it nevertheless marked the beginning of what was to become one of the most powerful dynasties in the history of college football. Following this loss, Oklahoma went on to win eight of its last ten games, capping the season with a Gator Bowl win. And in 1947, when Bud Wilkinson took over the coaching position from Big Jim Tatum, the Sooners began a stretch where for the next twelve seasons they went an amazing 114-10-3 run, one which included six bowl wins, four undefeated seasons, and a li'l ol' 47-game winning streak. The Sooner depicted on the cover you see here was about to show that he meant business.